Welcome to Markplex tutorial 96 in this collection of tutorials designed to help you learn TradeStation EasyLanguage programming skills. Please join our email list if you have not already done so and we will let you know when we release new tutorials or programs. 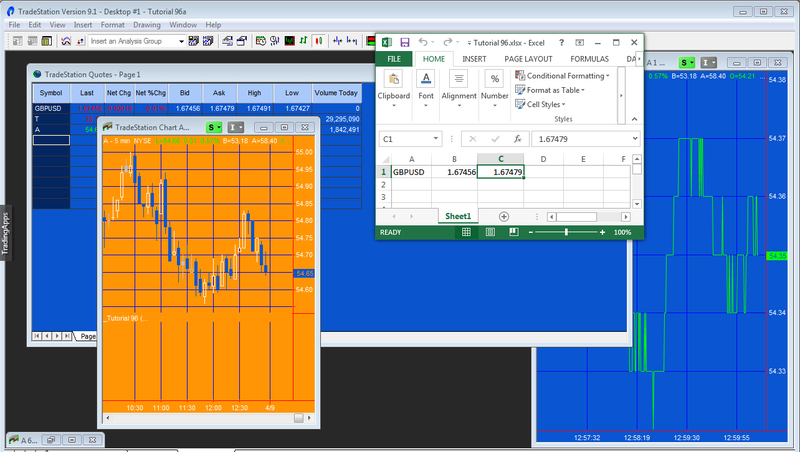 Tutorial 96 demonstrates how to create an indicator that reads a symbol name from a Microsoft Excel spreadsheet and writes the bid and ask prices in real time back to the spreadsheet. It uses the QuotesProvider component to gain access to updated information from the quotes data stream. This data is written to specific cells in a spreadsheet. NOTE: A more sophisticated version of the program is available for free to Gold Pass members here. If you are a Gold Pass member you will need to be logged in to see the program and the associated explanatory video. If you want to save yourself some typing, an unprotected version of the tutorial 96 indicator is available immediate download for only $19.95. The program will not work in MultiCharts. A more sophisticated version of the program is available for free to Gold Pass members here. For the program to work, this must be a valid Excel workbook and the path must be correct. 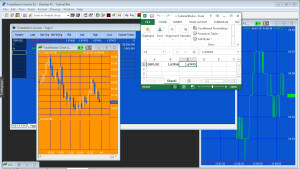 You also need to make sure that you have access to a price feed for the symbol that is entered in the spreadsheet.